Spectrum is a licensed, insured, IICRC-Certified, and CRI-approved carpet cleaning provider serving the greater St. Louis area for more than 27 years. Before setting an appointment for carpet cleaning services, determine which areas of your home are to be cleaned and their approximate sizes. Call our office at (636) 680-5555 or toll-free at 1 (877) 432-6086 to speak with a company-certified carpet cleaning expert. 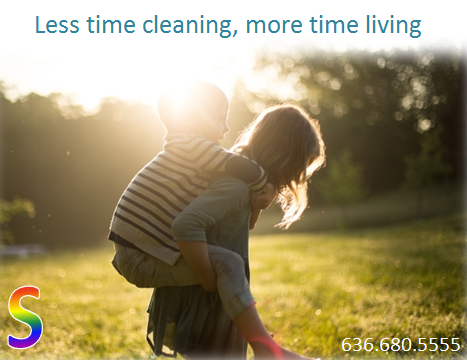 They will be available to explain the unique features of Spectrum's revolutionary cleaning process, answer any questions, and schedule an appointment. Be prepared to give them your name, address, phone number, email address, and a description of the areas to be cleaned. Read these tips on how to prepare for you appointment. A confirmation call is able to be sent one day prior to a scheduled cleaning upon request. A company representative will call to confirm your appointment thirty minutes prior to their arrival at your home on the day of scheduled service. The technician will arrive at your home during the time frame given to you at the time of scheduling. The technician will apply protective booties prior to the inspection. Additional pairs of protective booties are available upon request. The technician will inspect all areas to be cleaned, identifying areas of concern, and explaining our services available at an additional cost, if needed. Corner guards and walk off mats will be installed to protect walls and flooring. Our trucks carry a tank of water for cleaning, but an additional water source may be necessary for the technician to complete the cleaning. The technician may ask to use an outdoor spigot. The technician will apply the appropriate cleaning agents to the carpet. The technician employs a temperature-controlled, purified hot water extraction process to remove the soil. A final inspection will be performed to ensure quality throughout. Our knowledgeable technician can answer any questions you may have. Furniture tabs may be available upon request. Sometimes steam cleaning can bring old stains up to the surface once the carpet dries. If this happens, we would be happy to come back to treat the stain for an additional charge. Spectrum technicians employ a unique process called "The Spectrum Advantage", which first focuses on loosening soil that has chemically bonded with your carpet fibers, weighing them down and resulting in a dark, flat appearance. Utilizing a water-based, non-toxic product, Spectrum technicians agitate the carpet, allowing the soil particles to chemically bond to the cleaning product and rise to the surface of the carpet pile. After the soil has been loosened from the carpet pile, the IICRC-certified technicians employ a temperature-controlled, purified hot water extraction process to fully remove all soil. By first loosening bonded soils and removing them, the Spectrum Advantage significantly lightens the carpet, resulting in a newer, livelier appearance. This service is available for an addition charge.